Every year 30th of May is celebrated as “World Otter Day” across the world. The aim of the day is to draw attention to the 13 species of otter – ALL of them are listed in the IUCN Red List. It is often assumed that these species are doing well, but in reality, they are facing many threats. We need to draw attention to the threats like – habitat loss, hunting, illegal trade for furs and pets. India is home to three species of otters, Smooth-coated otters, Small-clawed otters, & Eurasian otters. There is very less information available about their status, distribution and threats. In Gujarat Smooth-coated otters are found in isolated patches. One of their major distribution patches lies between Surat and its surrounding area. 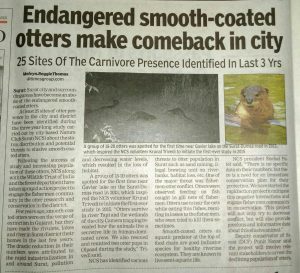 Being data deficient species, Nature club Surat conducted a study on its distribution in Surat which revealed over 25 different sites of otters. Nature Club Surat along with Wildlife Trust of India running project Otter Conservation Project in Surat. This Project started in February 2018. The aim of this project is to understand otter ecology and understand threats faced by otters in the human-dominated landscape. Currently, this project is undertaking activities like human-otter interaction survey to identify potential status, distribution, and threats. One of the major findings of the project is the Negative interaction between Fisherman and otters in River Tapi. Otters are often observed damaging nets while feeding on fishes caught in gill nets. Each net cost between 800-1500 rupees. Due to which fisherman suffer financial loss and try to harm otters. Nature Club Surat and Wildlife Trust of India is focusing on making a compensation scheme along with Forest Department for resolving this negative interaction. The project also aims to bring all stakeholders on the same platform. NCS and WTI will also be conducting outreach programs for raising awareness of otters. Otters are endangered species and each and every otter is important to the environment. we hope that you will be joining in with World Otter Day and raise awareness about just how important they are to the environment, how they suffer as part of the illegal wildlife trade and how much they need our help; Encourage more people to care about and be passionate about otters.